In a State full of classic, shabby-chic and modern architecture, Culburra, which is located somewhere along the New South Wales’ Shoalhaven Coast incase you didn’t know, is single-handedly (and unashamedly) keeping ’70’s design alive and kicking. 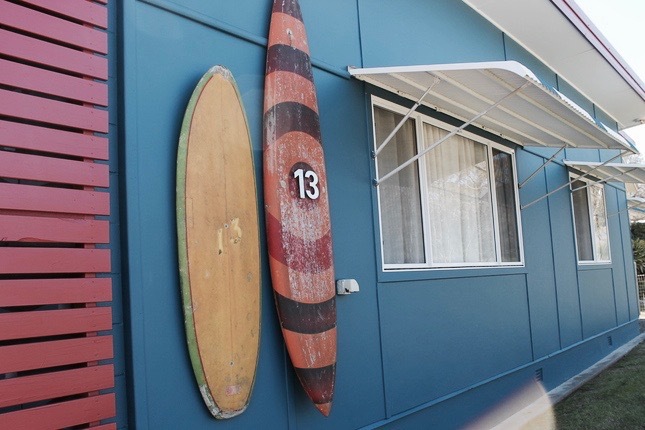 Call them what you will, but the colourful Culburra Beach Shacks make a statement! I’ve never seen as many retro-inspired or restored beach shacks in one place until I laid eyes on this sleepy little beach town just south of Sydney. It’s like the residents held a ‘1973 Convention’ one day and agreed that a seventies disco would explode all over the street, ensuring that at least a couple of houses on the block maintained those wildly coloured facades and groovy vinyl patterns inherently symbolic of the flower-power era. An interesting Planning Scheme to say the least. Now before you die-hard Minimalists start conjuring up everything that was wrong with the 70’s design aesthetic (think lava lamps, dizzying prints and that disgusting green hue that could best be described as the translucent colour of vomit), I am here to tell you that none of these feature prominently in any of the Culburra beack shacks (thank god). Instead, what one finds is a thoughtful and tongue-in-cheek take on vintage like repurposed tables and chairs, stylised flowers and laid-back surf-inspired prints, and of course lots and lots of bright colours! You can’t help but think that the residents and owners are having just as much fun manifesting these quirky designs as the visitors have exploring them!